The Centre is located in Copenhagen, Denmark at Hvidovre Hospital in separate buildings just north of Center 3. Parking area is in the basement or at some of the other P-areas. Alternatively, taxis can bring you directly to the DRCMR (click for route). A Taxi ride from Copenhagen Airport to Hvidovre Hospital takes approximately 15 minutes and costs around DKK 270 (mostly highway). From the basement: Take stairs/lift one level up to "ambulatorieetagen", and follow signs towards sections 334, 339 and 340, pass the reception, go to the end of the corridor and take the stairs or the lift one floor up to MR-Forskning. From the parking west of the hospital (P2): Walk parallel to the motorway up the hill, where you will find Pavillion 7. Ring the bell near the white nitrogen tank. Getting to the hospital by bus: Line 1A goes every few minutes from the Copenhagen Central Station to the main entrance of Hvidovre Hospital it takes about 25 minutes. For details please consult the hospital transport guide. By car/bike: Park in Center 3 in the cellar under the hospital. Walk one floor up (ambulatorieetagen) and follow signs to the MR department. By bus: Get off at the hospital main entrance. Stay at the ground level and go towards the MR-department located in Center 3. Ten meters before you reach the reception of the MR-department: Turn right through the glass door and left immediately after. Knock or go to the reception of the MR-department if the door is locked. You may get to the DRCMR meeting room in Pavillion 7 via the back entrance (easiest if coming by car) or through the hospital. 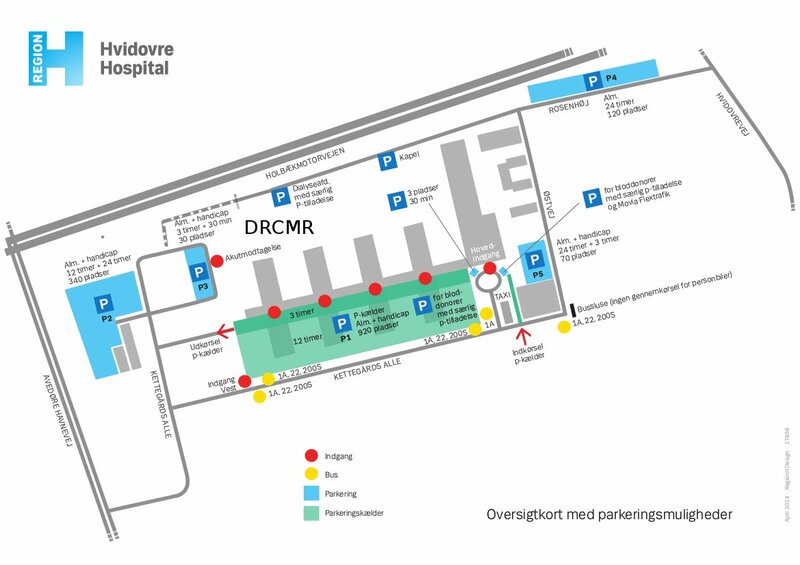 Parking is mainly available outdoor east and west of the hospital (near the emergency ward, "Akutmodtagelsen", and at Rosenhøj/Østvej). From either of these places, walk parallel to the motorway up the hill, where you will find Pavillion 7. The meeting room is located on the 1st floor (entrance in the east end). By car/bike: Park in Center 3 in the cellar under the hospital. Walk one floor up (ambulatorieetagen) and follow signs to the MR department ("MR-afdelingen"). Go past the reception to the end of the corridor, and one level up to the MR research section. By bus: Get off at the hospital main entrance. Stay at the ground level and go towards the MR-department located in Center 3. Follow directions above. At the DRCMR: From the reception of the MR department, follow the corridor to the dead end where elevator and stairs are present. The MR research center is one floor up. Call a contact, or ring the bell to get to the offices. From other locations, follow the directions to the DRCMR meeting room in Pavillion 7 above. Hartwig's and Karam's offices are just opposite this. The FBE management: Top floor of center 2. Elevators and stairs above basement with parking. After submission, scroll down to check if sending was succesful.